When you go to properties of any folder, there are many details about that folder which are Size of folder, name of folder, type of folder etc. There is also one tab which is “Security” tab. This tab can allow users to make permissions of that folder to anyone. Or change the privacy to full control or limited control. Some users want to remove this “Security” tab so that no one can change or modify the security permissions on that system. In this article I am going to describe 3 ways for show/hide the Security Tab of your folders. When you open it, in right window you’ll see the “NoSecurityTab” change its value to 1 by modifying it. And refresh your window. And here you go. Security tabs from each folder will hide from every one. Whenever you want to show it again, again go to same registry path and set its value to 0 again, the security tab will be visible again. 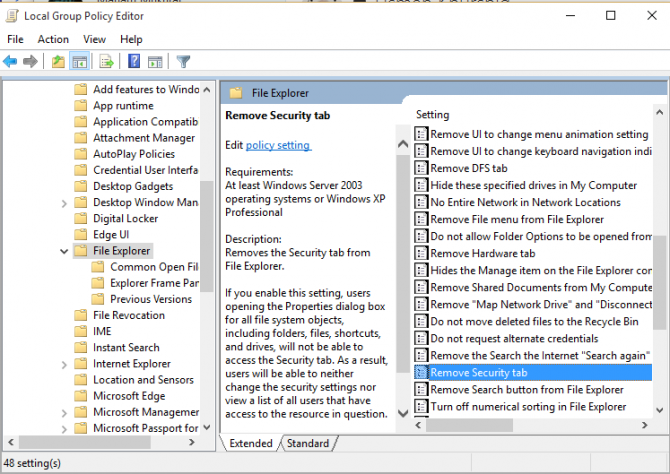 You can also show/hide “Security” tab through Group Policy editor. 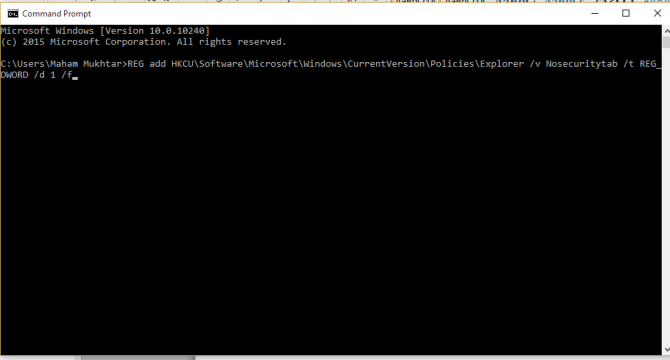 Open the “Local Group Policy editor” by writing it in Start Menu. Then open the first result it gives you on typing. Now open the User Configuration\Administrative Tools\Windows Components\File Explorer and double click on it, now open Remove Security Tab from right hand side window. When you open “Remove Security Tab”, there is 3 options: not configured, enable and disable. If you want to remove Security Tab, select the “enable” and if don’t then press on “disable”. After selecting any option press “OK” and your settings will be changed. This is another easy and simple way to hide/show Security tab. Giving specific commands on Command Line Window can also enable or disable the “Security” tab. 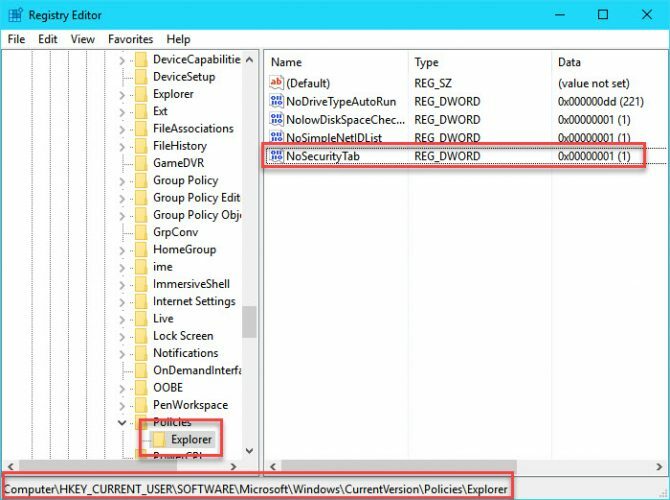 Following are commands for enabling and disabling the “Security” tab. After entering your required command, press enter and close the CMD and you are done with enabling or disabling the Security Tab. 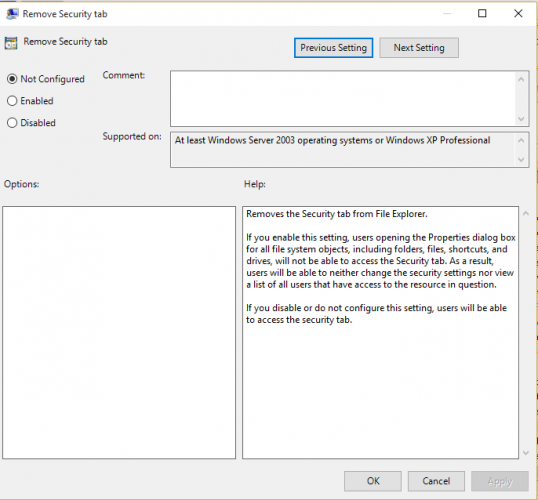 Above three are easy and simple ways for your problem of enabling or disabling the Security Tab. You can go for anyone of them. All are simple and reliable ways. I think the instructions for modifying the registry are incorrect. The value of NoSecurityTab should be 0 if you want the security tab, and 1 if you do not.